Recently I contacted the Hopi Department of Social Services when I found out they had need of supplies for Hopi foster children. I spoke to Lorene Vicente, who manages the Foster Care Program, and she said that as of August, 2017, they had 120 Hopi youth in foster care who were placed on Hopi, in Winslow (where there is a Hopi community), in Flagstaff and Phoenix. She indicated need for school supplies, backpacks, duffel bags (for carrying their belongings when the kids are moved) and beds. I did some background research to understand more about Native American Foster Care and found out that children tend to stay in the system longer than in non-Indian foster care. I share below information about the Indian Child Welfare Act that governs Native foster care along with some perspectives on need to improve care. The Indian Child Welfare Act of 1978 (ICWA), enacted November 8, 1978), is a Federal law that governs jurisdiction over the removal of Native American (Indian) children from their families. ICWA gives tribal governments a strong voice concerning child custody proceedings that involve Indian children, by allocating tribes exclusive jurisdiction over the case when the child resides on, or is domiciled on, the reservation, or when the child is a ward of the tribe; and concurrent, but presumptive, jurisdiction over non-reservation Native Americans’ foster care placement proceedings. ICWA was enacted in 1978 because of the disproportionately high rate of removal of Indian children from their traditional homes and essentially from Indian culture as a whole. Before enactment, as many as 25 to 35 percent of all Indian children were being removed from their Indian homes and placed in non-Indian homes. In some cases, the Bureau of Indian Affairs (BIA) paid the states to remove Indian children and to place them with non-Indian families and religious groups. The per capita rate of Indian children in foster care was nearly 16 times higher than the rate for non-Indians. If Indian children had continued to be removed from Indian homes at this rate, tribal survival would be threatened. Congress found that because of the differences in culture, what was in the best interest of a non-Indian child was not necessarily what was in the best interest of an Indian child, especially as they have traditionally larger extended families and tribal relationships in their culture. ICWA gives tribal governments a strong voice concerning child custody proceedings that involve Indian children, by allocating tribes exclusive jurisdiction over the case when the child resides on, or is domiciled on, the reservation, or when the child is a ward of the tribe; and concurrent, but presumptive, jurisdiction over non-reservation Native Americans’ foster care placement proceedings. The federal government in 1978 created a separate set of rules for tribal children that makes it more difficult to remove them from their parents’ custody and place them for adoption with a non-tribal family. By the time Congress passed the Indian Child Welfare Act, the Association on American Indian Affairs estimated between 25 and 35 percent of all tribal children were being removed from their parents. Eighty-five percent were placed in non-Native homes or institutions. The Indian Child Welfare Act raised the burden of proof for both placing a Native American child in foster care and terminating parental rights. Once it is determined that a child should be placed in foster care or put up for adoption, the Indian Child Welfare Act requires that the state first attempt to place the child with a member of his or her extended family, second, with another member of the tribe, or third, with another Native American family. If the Arizona Department of Child Services suspects a Native American child is being neglected or abused, it takes longer to get them to safety than it does for a child of any other race because of the additional burden of proof. Once they are placed in foster care, years often pass before the children are either reconciled with their parents or the state decides to sever parental rights. In the meantime, because there is a severe shortage of Native American foster families, the vast majority of children are placed with non-tribal families who are not allowed to adopt them when the option arises. The courts often struggle to find permanent tribal homes for the children, so they end up bouncing from place to place until they turn 18. The law is designed to protect the best interests of Indian children and promote the stability and security of Indian families. ICWA is as necessary today as it was in 1978, as Indian children continue to be disproportionately represented in state foster care systems at almost three times their population rate, and in some states as high as 12 times their population rate. procedures governing emergency removal of Indian children from their homes.Over the last six months, states and tribes across the country have been preparing to implement the regulations in a variety of ways, including: revising state and county policies and procedures, jointly developing and attending trainings, and collaborating to identify best practices needed to ensure effective implementation. “Across the nation, child welfare agencies are struggling to meet the demand for foster parents,due in part to recently increasing numbers of children entering out-of-home care. This need is particularly acute for American Indian children. 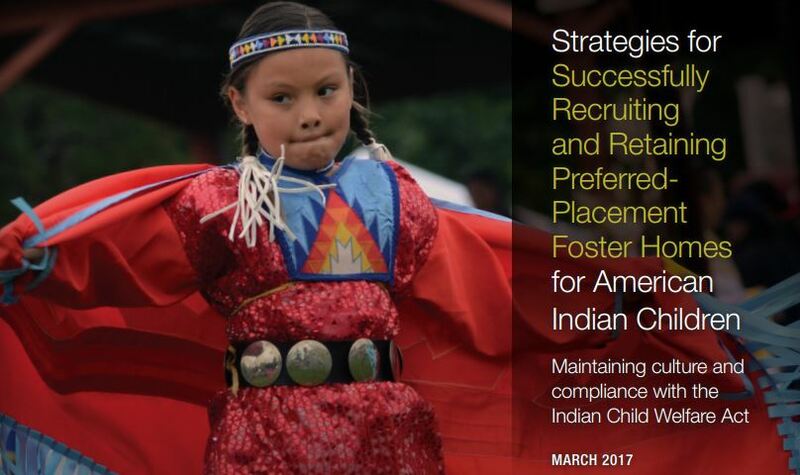 ICWA dictates, and good practice necessitates, that when foster care is needed, American Indian children should be placed in foster homes that re ect their culture and community. Report prepared by: Lydia Killos, Nancy Lucero, Megan Kauffmann, Misty J. Brammer, Sheri Freemont, and Erin Maher. If you have an interest in providing support for Hopi youth, please see Hopi School Children Support.